DONATE NOW, and help us transform the life of one more cat or dog. 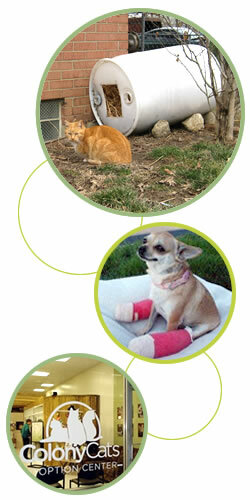 Your donation, in any amount, is greatly appreciated and will directly benefit animals in need. Note: Some employers offer a donation matching program. Check with your employee benefits department to see if your employer offers such a program and increase your giving power! Colony Cats (& dogs) is a 501(c)(3) non-profit organization. will open and you can type in your donation information. A recurring monthly donation is an easy way to give animals in need a deserving second chance throughout the year. Set up your secure, recurring donation via EverButton. It's easy! Just click the blue "recurring donation" button to the right. Select the amount and frequency of your donation. This is an easy way to automatically help Colony Cats and give animals in need a deserving second chance throughout the year. You can also do a recurring monthly donation by contacting your bank about setting this up through online bill payment. The amount you choose to donate will automatically go to Colony Cats (& dogs) each month. open hours (while you're there you can visit with some of our wonderful adoptable kitties). 2740 Festival Lane, Dublin, Ohio 43017. To continue our work we urgently need your support. The average cost for our organization to spay/neuter each cat is $40-$55, and $65-$105 for each dog. During periods when there are many kittens, we fund more than 50 spay/neuter procedures each month. The fee for vaccinating, testing, and microchipping is $40 per animal (some also require medical care). Our needs are great; food for our foster cats and dogs, warm shelters and straw bedding for our homeless cats, and funds to maintain our Adoption Center. In fact, our typical monthly expenses to maintain Colony Cats Adoption Center, including food and basic supplies, is more than $4200. Fund spay/neuter efforts for feral, stray, and abandoned cats in our communities, as well as dogs in need. This includes our Trap-Neuter-Return programs and subsidizing spay/neuter outreach for owned cats and dogs. Maintain a network of foster homes for adoptable cats and dogs, together with our placement program for animals rescued from the streets or from "death row" at shelters. Educate our communities about animal overpopulation and solutions. Click here to download the list. Print it and take it with you while out shopping, or share it with others by posting it in your community. Please drop off wish list items during the center's open hours. Another fun way you can donate items we need is through our Amazon wish list. Quickly and easily purchase food, litter, and other supplies for the cats and dogs in our care using Amazon. Choose the items you wish to donate and Amazon ships them directly to us. Click here to visit Colony Cats' Amazon Wish List page – where you can shop online for useful items that we've picked out. It's a simple way to make a donation of things we really need! IT'S A GREAT TIME TO ENROLL! Kroger's Community Rewards is a free and easy way to help raise funds for Colony Cats. Once you're registered you should see Colony Cats listed as your community rewards recipient at the bottom of your store receipts. There's no cost for you to take part – just swipe your Kroger Plus card when you check-out, and Colony Cats automatically earns dollars! Thanks for taking part in this easy way to support Colony Cats. Spread the word – ask your friends and family to sign up too.